1. You need to use BBcode to post embedded images on this forum. Make sure they do not extend the width of 700px, because such a width breaks this forums layout. Aris wrote: 1. You need to use BBcode to post embedded images on this forum. Perfect! At least on your end. I made the CSS changes (I substituted #D4D0C8 for the lightgrey background color). It is now exactly what I wanted. I have attached an Imgur link so you can see the results. As before, the red arrow points to the thread being displayed, and the green arrow to the new color. And the black text is easily readable. 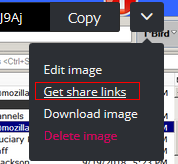 I tried just putting the above imgur result inside the [Img] brackets shown on the menu bar for this message, but that did not work. Looking at your text, I noticed that there was a .png added at the end of the imgur code. My original was a .png file, so I added that to my imgur code. But that did not work either. So can you give me the link to the old imgur for future reference? But I am completely satisfied at this point. Again, thanks for creating such a useful addon. When uploading an image there is a note "leave beta", if you are on the beta page, but it does not matter (anymore? ), because the arrow always appears for me even in other browsers. Thanks. I was looking at the Copy on the right side, and never hovered over the image. I just tried it in Preview mode, and it works fine! You do such a great job with CustomizeMyBird, and your individual help has been wonderful. I would like to make a contribution, but it appears that you only accept Pay-Pal. I don't use Pay-Pal. Do you accept credit cards? Sorry, I don't use any other services for such money transfers, but I also accept Amazon, Google, PaysafeCard etc. gift cards. Is there a way to export/import settings or is that still to be added? At the moment there is no export/import feature available for CMB, but it might be added in the future. Aris wrote: Sorry, I don't use any other services for such money transfers, but I also accept Amazon, Google, PaysafeCard etc. gift cards. I checked on Amazon. They require an email address for the recipient, which I am not sure you want to post here. I can purchase physical gift cards at my local stores, and mail one to you. Do you live in the US? The local cards are probably in US dollars. Hi, I hope this is a simple fix, but in the process of trying to get darker text in Thunderbird (using CMB) I have somehow lost the colour-coding of tagged messages. The messages still behave as if tagged, but the text colour remains black or bold. I didn't notice for a day or two, so I can't remember exactly which settings I changed. I find the list of options in CMB hard to distinguish, despite being reasonably computer-savvy, so I was wondering if someone could tell me which section would most likely have caused this change. It is also possible that the change might be caused by "Theme Font and Size Changer" which I was also using to change the light text, and I changed the font to Segoe UI. Next update will improve handling of tagged colors. I see - if I choose to use the customised options in that section, then the tag colours are lost. At this point, the tags are more important so I have turned that section off and it worked. I had seen that statement, but didn't understand what it meant. Hopefully, in the future (as you mention) we can have both. Thanks for your help. It offers a new option to display default tag colors for text atm. Mozilla did this by offering additional CSS code for every hex color offered by the the 7x10 color matrix of a default colorpicker. 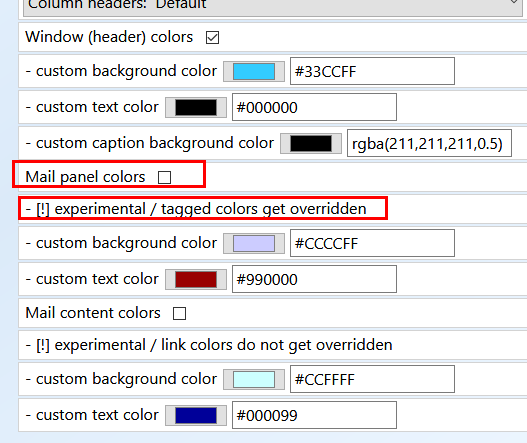 So if you are using own tag colors, make sure you set them from the color picker or they won't be recognized. I won't offer support for all possible hex combinations. I have noticed a problem with this extension. o if I close Thunderbird using File->Quit or Ctrl-Q the window maximizes to full-screen width (but not height) on shutdown and keeps that width at next start-up. Also, just disabling this extension in the Extension Manager list causes the window to switch to maximum width. Enabling the extension allow me to shutdown OK with File->Quit once, from then on the problem is back. This is on Kubuntu 18.10.